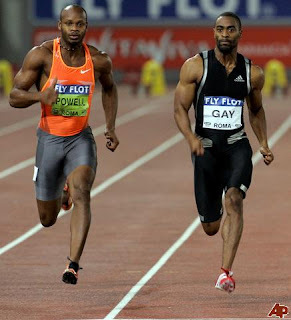 THESSALONIKI, Greece (Reuters) - World silver medallist Tyson Gay overhauled former world record holder Asafa Powell to win the men's 100 metres at the World Athletics Final on Saturday. Gay, the second fastest man ever behind Olympic and world champion Usain Bolt, edged Powell on the line to win by two-hundredths of a second in 9.88 seconds. The race is embedded below. Bolt will run in the 200 metres on Sunday. "I didn't know if I was going to be able to make up the distance when I looked to the finish line and saw the lead he (Powell) had," Gay told reporters. "But I just gave it everything in the last few metres and thankfully I was able to do it. It feels pretty good to get the victory." Asked if he could ever catch up with Bolt, Gay replied: "It's difficult to say. I've overcome my groin injury now and I do believe I can run 9.60 or under." Bolt reduced his own world 100 record to 9.58 seconds at the Berlin world championships last month. Olympic champion Yelena Isinbayeva, who failed to clear a height in Berlin, was unable to break her own world pole vault record of 5.06 metres set in Zurich last month. But the Russian said she thought she could still better the record this year with meetings to come in Shanghai and Daegu, South Korea. "I've had my ups and downs during the season so I am very happy with today's win. I still think a 5.20 metres jump is reachable," she said. The men's 3,000 metres provided one of the highlights of the evening as Ethiopia's 5,000 world champion Kenenisa Bekele and Bernard Lagat of the United States reprised their epic Berlin battle. Lagat, who took silver behind Bekele in Berlin, attacked on the final straight but in another exciting sprint finish Bekele repulsed his rival's challenge, holding on to win in 8:03.79. The loudest cheer of the night was reserved for Bolt, who has confirmed that the meeting will be his last of year. The 23-year-old Jamaican entered the stadium midway through the session to give the fans an official greeting and his famous "Lighting Bolt" celebration jig. He then promised "something special" in Sunday's 200.